LAFC added another weapon to their offensive Monday with the addition of forward Christian Ramirez. The Southern California native,originally from Santa Ana, California returns home to boost his new ball club. Ramirez was acquired from Minnesota United FC where he was the club’s all-time leading goal scorer since the team joined the MLS scene last year. In the trade, Minnesota United received $250,000 in General Allocation Money, $100,000 in Targeted Allocation Money in 2018 and another $200,000 in 2019 and up to $200,000 in future Allocation Money based on the his performance with LAFC. All the money Minnesota received will go to the team in either 2018 or 2019. Coming home to Southern California, @Chris_Ramirez17. Ramirez received high praise for what he can get done on offense from John Thorrington, LAFC’s General Manger and EVP of Soccer Operations. “To be able to add a proven MLS goal scorer in Christian is a win for us” Thorrington said in an LAFC press release. While in Minnesota, Ramirez played in 50 MLS games starting 44 of them scoring 21 goals and five assists. The 27-year-old this season has buried seven goals with two assists in 20 games. Ramirez also led Minnesota in scoring with 14 goals last season and scored the club’s first ever goal on March 3. Ramirez joins a talented forward group alongside Carlos Vela, Diego Rossi, Adama Diomande, Latif Blessing and Marco Urena. 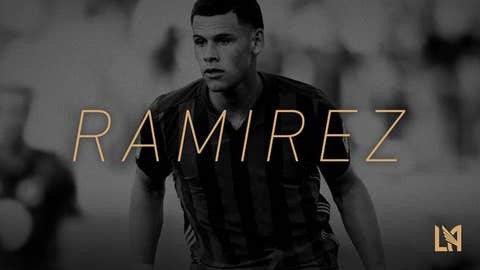 Ramirez will likely make his LA debut this Saturday, August 11 against Sporting Kansas City.